Which Sound System to Use? The Right Recipe.The Right Technology. The answer to this question lies in the name of the technology itself: the very concept of immersive sound is to engage the audience by creating a sound environment that transports the moviegoer into the heart of the action of the movie. Since the emergence of sound in movie theaters, audio configurations have not stopped evolving. From the original mono feed, the cinema industry moved toward a stereo configuration to heighten the sensation of movement within the auditorium. The arrival of surround sound technologies in the Eighties allowed sound mixing engineers to create movement from the screen itself to the rear of the auditorium. Finally, nearly five years ago and following various tests, a handful of manufacturers released new technologies that enabled flyover and environmental effects (e.g., a spaceship hovering and moving above the audience). From a basic rendering, movies could suddenly have an exceptionally realistic soundtrack using existing technologies, creativity and knowledge. For cinema exhibitors, immersive sound has been perceived from the start as the best way to differentiate themselves from home entertainment with large flat-screen TVs and 5.1 home-cinema setups. Immersive sound is not only about utilizing the best technology but also enhancing the movie-going experience and bringing audiences back to movie theaters. 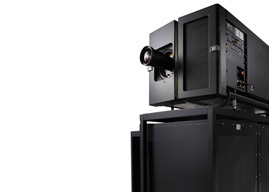 Immersive sound technologies are the next logical step in the future of cinema technologies. The simplest way to achieve enhanced immersion is to increase the number of channels and evolve from a 5.1 to an 11.1 setup or even higher. Additional channels would be used for overhead information and flyover effects. Of course, this means adding loudspeakers inside the auditorium with these new channels. In terms of effects, this solution is ideal for natural environment sounds (e.g., a forest environment, an orchestra or the rumbling of a crowd). This method of increasing the number of channels to obtain more immersive effects was first proposed by Dolby during the jump from 5.1 to 7.1, and then by Barco, which introduced Auro 11.1 in 2011. However, as this approach was not really adapted to creating realistic or precise effects (e.g., the movement of a vehicle or the effect of gun shots) certain manufacturers began to study audio objects. Audio objects are sound effects that are not linked to one single channel but can be moved around the room according to the physical configuration of the loudspeakers in the auditorium. In order to efficiently move an object, the cinema sound processor needs to be properly configured within the setup of the room. This involves a higher degree of digital signal processing and the quality of the effects clearly depends on the number of loudspeakers that can be separately addressed. One pioneering company known for the use of audio objects was Germany’s IOSONO, acquired by Barco in 2014. Following these explanations, one can easily conclude that the best solution would be a hybrid solution between channel-based (to create an environment) and object-based (for effects) technologies. This approach was first adopted by Dolby with its unveiling of Atmos in 2012. Barco’s AuroMax followed in 2015, after the successful integration of IOSONO. As mentioned earlier, the best technology to date is one that offers a mix of channel- and object-based effects. Additionally, the technology must be seamlessly integrated into the content creation and delivery process to avoid multiple DCP masters. It is also deemed necessary to rely on a 5.1/7.1 back-up downmix. The two market leaders currently offering hybrid solutions are Dolby and Barco with their Atmos and AuroMax technologies, respectively. Discussions are underway through the various international cinema industry associations (UNIC, ICTA, NATO and SMPTE) to standardize the methodology used for immersive sound creation and delivery. The ultimate goal is to offer a clear solution to cinema owners and ensure that sufficient content is available for these new, highly-advanced technologies. The Right Recipe. The Right Technology. Creating a “WOW” effect is obviously the goal of every technological evolution. There is a balance to be reached between the investment and end-user perception. There isn’t one perfect solution for all cinemas. Get in touch with CinemaNext’s skilled engineers and technicians to develop a vendor-agnostic approach to immersive sound technology. Each individual project is studied with great attention by our experts to meet your technical needs and budget requirements. CinemaNext (formerly dcinex/Ymagis Engineering Services/R2D1/Proyecson) began its immersive sound tests and installations back in 2012 when it installed the first Barco Auro 11.1 at Barco’s HQ facilities in Belgium. In 2012-2013, the first Dolby Atmos installations were successfully implemented at Cineplexx multiplexes in Vienna and Graz (Austria). We’ve since overseen numerous installations across Europe, including at the Nordisk Imperial Cinema (Copenhagen, Denmark), Baneasa Grand Cinema (Bucharest, Romania), Cinecitta’ Multiplexkino (Nuremberg, Germany) and Cinespace (Bremen, Germany). Massive deployments followed shortly thereafter in Austria, France, Greece and the Netherlands, making CinemaNext the European leader in the implementation of immersive sound technologies with over 100 installations under our belt.